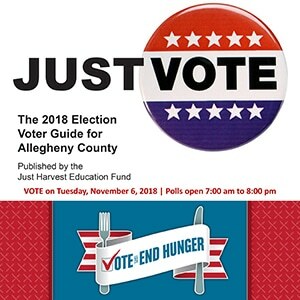 On Nov. 6, all voters in Allegheny County will have choice of four candidates for the office of U.S. Senator of Pennsylvania. Sen. Bob Casey (D) has held this seat since 2006. This is a six-year term. The other U.S. Senator of PA, Pat Toomey (R), is not up for re-election until 2022. 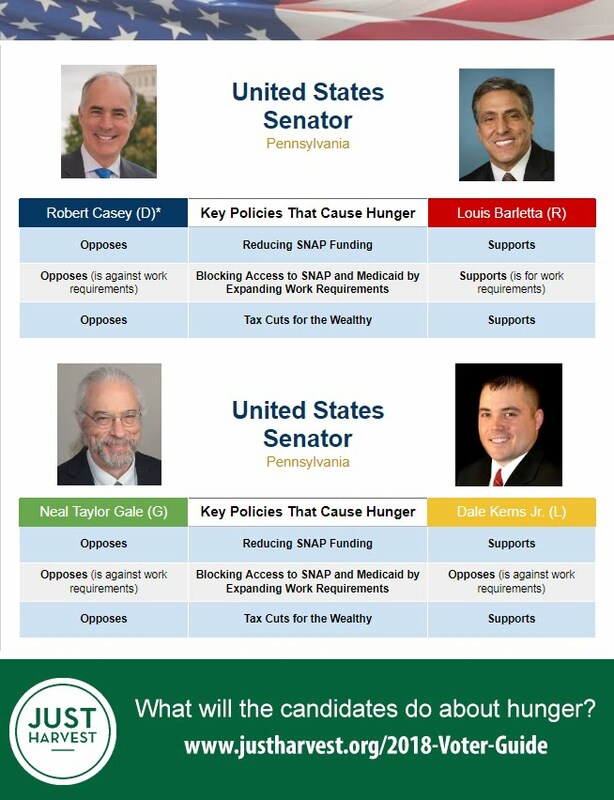 We asked each candidate three questions about their stance on key policies that contribute to hunger in Pennsylvania. 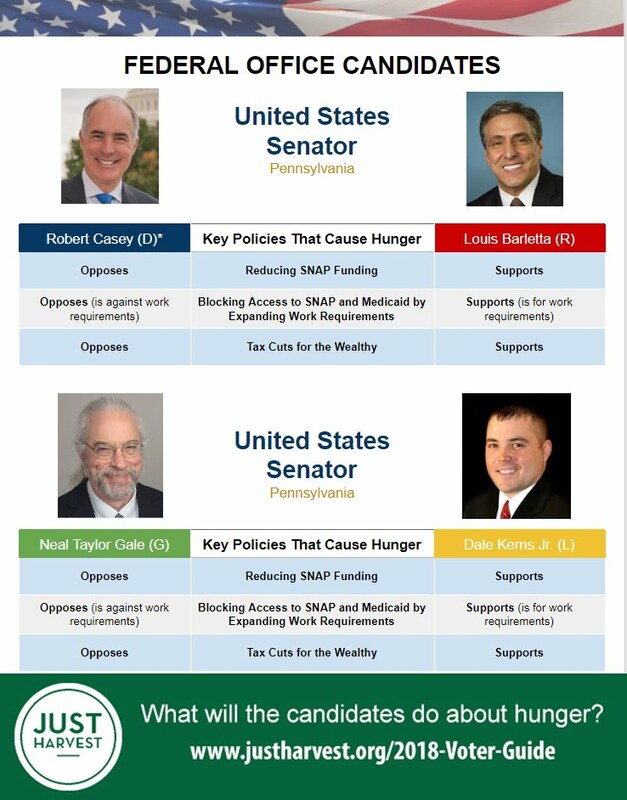 U.S. Sen. Casey and U.S. Rep. Barletta did not respond to multiple requests, so we determined their stance based on their voting records and public statements. Candidates Neal Gale and Dale Kerns, Jr. provided answers, which are below. Do you support reducing funds for SNAP, a program that helps feed over 40 million people in the United States? run a deficit, and that’s unacceptable. As a sovereign nation that prints its own currency, maintains a floating exchange rate and doesn’t incur debt in foreign currencies, the United States cannot become insolvent (refer to Modern Monetary Theory). Tax revenues do not determine government spending. The U.S. has the ability to spend what it wants, run a deficit and even build up the debt. That is not a financial concern. It is a matter of political will. If we want to take care of everyone, we can. Do you support work requirements as a condition to access public benefit programs, even though they would block otherwise eligible people from getting healthcare or food assistance? Requiring those who receive public benefits to work, represents a misunderstanding on the part of those who would impose such a regulation. After 22 years managing a low-income energy efficiency and energy affordability program throughout New Jersey, I have seen firsthand the nature of the low-income community. They are hardworking families, disabled citizens or elderly people. They are not avoiding work. This proposal is insulting and wrongheaded. As noted above, I believe we have normalized our spending priorities which now favor the very wealthiest of our citizens while leaving the rest to (mostly) fend for themselves. What we require is the political will to change that. Do you support the 2017 Tax Cuts and Jobs Act? I would NOT have supported this Act. It represents an un-disguised gift to America’s corporations and those who own them, along with the wealthiest of America’s families. I will work to develop a plan for clarifying the government’s spending and taxing process in order to generate the political will to re-form our priorities in favor of the public good. Assisting individuals in need of a helping hand is one of the most important tasks which any society can undertake. As a U.S. Senator, I do not think that I nor anyone else in the Congress or federal government should be able to dictate or allocate how funds are spent on improving access to food and nutrition to the poorest among us. For that reason, I advocate returning SNAP funds to the states in the form of block grants so that those closer to the problems in their local communities can allow for more particularized solutions. What works in some areas does not work in others, and I far more trust local communities to know what’s best over the cold hands of a federal bureaucrat. Much like with SNAP benefits, the federal government should not be imposing onerous requirements on how benefits are obtained. As was famously stated by Justice Oliver Wendell Holmes, using the “marketplace of ideas” is sometimes the best way to determine the validity of ideas. In the US, we have 50 laboratories for democracy (and even more if we look at cities and communities), and allowing these areas to present their models of how to help people is far more effective than any federal government mandate. I support the 2017 Tax Cuts and Jobs Act, because I want Americans to keep as much of their paychecks as possible, and I want the United States to be competitive on the global market in fielding businesses. That notwithstanding, I am perturbed that this tax cut bill was not paired with significant spending cuts. While I support a fundamental transformation of the American tax system, cuts in taxes are meaningless without significant reductions in spending. While Democrats covet domestic programs, Republicans appear unwilling to make any cuts to military spending. I would offer to compromise by not taking any programs off the table when it comes to cutting spending. We must keep prior obligations like Social Security, but spending is completely out of control. This can begin by using baseline budgeting: that is, instead of assuming an annual increase in funding for any given program, we should begin at an assumption that spending will not increase, and then cut from there. In every program our government manages, there is waste and graft which can be eliminated, so I have faith that mass reductions can easily be made without affecting essential government services.